Cheering for the Olympic Athletes! - Super Inky! As most of you know, I was adopted from Khabarovsk, Russia when I was a toddler. I am proud of my heritage and I was really excited with Sochi, Russia was chosen as the site for the 2014 Winter Olympic Games. However, I'm also proud to be part of a two-mom family and I have been really sad to see the way that people from LGBT families are being treated by the Russian government. I really struggled with whether or not I wanted to watch the Olympics this year, but in the end, I decided to support the athletes from around the world and their hard work. 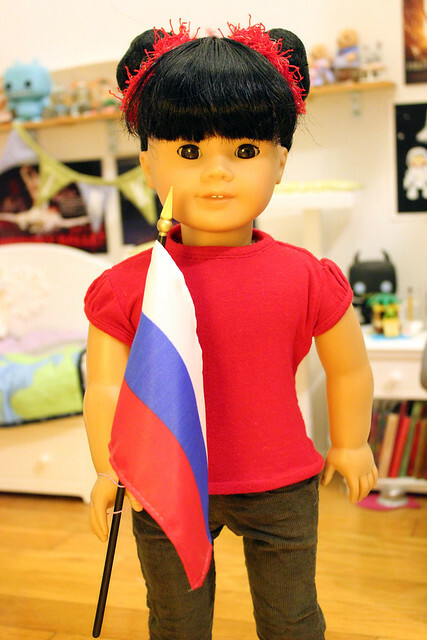 Not too long ago, I got out my Russian flag and invited over some friends from my Russian-language kids group to watch the Olympic opening ceremonies on TV! I go to the group so that I can maintain my Russian language skills. It's a great way to meet other kids who speak Russian too! My mama speaks Russian with me at home, but my mom doesn't speak much Russian, so we mostly speak English. The group gives me a chance to speak Russian with other kids. This is my friend Ksenia. She joined the group a few years ago. She is part Russian and part Kazakh and grew up in Almaty, Kazakhstan until she moved to Brooklyn with her family. 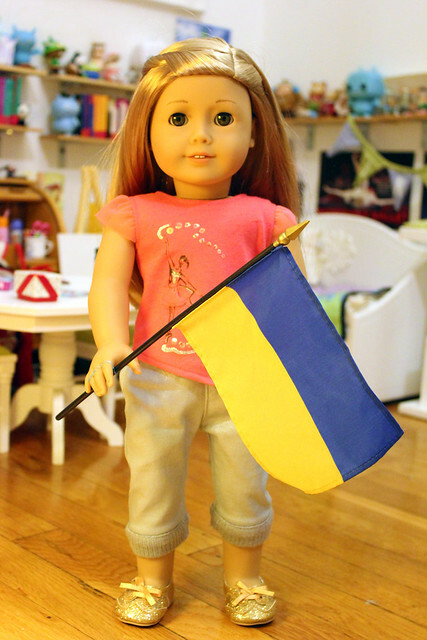 She brought over Kazakhstan's flag and waved it proudly! And here's the newest addition to the group- Polina! Polina is from Kharkov, the same city in Ukraine where my mama lived as a teen. She just moved to New York City at the beginning on February. Polina is really nice and it was fun to talk with her about Kharkov. I have visited Kharkov several times and I was really excited to find out if my favorite places where the same as Polina's! I really enjoyed having my friends over to watch the opening ceremonies! We have been watching our favorite sports and keeping track of how our home countries are doing. My favorite sport to watch is figure skating! What is your favorite Olympic sport? Are you watching the Olympics this year? In this entry I'm wearing: red shirt and corduroy pants made from Liberty Jane patterns and Kit's Work Boots by American Girl. You and your friends are so cute together, Inky :) Welcome, Polina! Thank you Juliet! I'm so glad Polina moved to NYC! I think she is a MYAG #54. I looked it up on AG wiki for you. She's cute, huh? I love the Jess face mold! Hiya Jessica! Thanks so much for the help, she really is cute, and the jess face mold is to die for. I wish she wasn't a girl of the year so i could still by her. Hi Ellie! Jessica is correct, Ksenia is a MyAG 54. However, she has been customized to have decal brown eyes- MyAG 54 normally has pinwheel brown eyes. Hope that helps! Saludos Inky! This helped a bunch, I love your blog sooo much. Keep on writing! hey inky, i have a few questions. where did you get ksenia's outfit? also, where did you get all of your American girl doll books? did you buy all the mini dolls or did you get them from somewhere else? And one last question. where did you get all of your little figures that are on you shelves? Ksenia's hairbows are from Gymboree. The shirt is from Liberty Jane clothing. The skirt my grandma made out of a Gap tee. The shoes are from ABeeLine on etsy. Yes, my mini books are from the American Girl mini dolls. The figures I have collected from different places over the past several years. Looks like you girls had fun together! My dad was 1/2 Ukrainian, so that makes me 1/4! That is so cool! Does your family still celebrate any Ukrainian traditions? Yes we do! We do traditional pascha baskets at easter time, make psanky eggs, have a special meal for Christmas and loads of other things! She isn't posting on there a lot anymore, but will still be posting when she has time. Thanks, Inky! Oh, and can I say, you have such an awesome name! It looks like you girls had a great time. I rooted for France of course. Christelle's sister, Marie-Christine, is into ice skating, and she enjoyed it. She texted me about it yesterday. Aurélie LOVES Polina's shirt. She hopes to get one like it someday.